Embrace the traditional way of cooking pizza with the Lisboa ‘Escape The Indoors’ Wood-Fired Outdoor Pizza Oven. Cook over an open flame for an intense smoky flavour and a crisp finish to your pizza. Highly weatherproof, this traditional wood-fired pizza oven is made to withstand the elements while still maintaining a sense of character and charm. Though it takes a little while to get going, once heated it can reach up to 700°C, maximising power and output. Made from sturdy terracotta brick with an iron face door, the Lisboa Wood-Fired Pizza Oven is durable and sturdy. It is triple insulated with high quality brick to ensure a professional standard of cooking every time. The iron face door is coated in lead-free zinc to ensure safety while cooking. It opens in a dutch/barn fashion and can be closed and secured easily. The exterior can be painted or tiled to a design of your choice, offering versatility for your home. The Lisboa Wood-Fired Outdoor Pizza Oven is made from crack-resistant materials to avoid damage, even with long term use. The oven also comes with Ultra Fire – a crack repair kit – in case any small cracks should develop. Even in the event of hairline cracks, this should not affect the functioning of the oven. 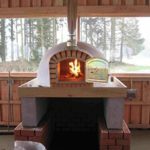 This attractive pizza oven does not always come with a base, so it’s up to you whether you choose to buy one that fits the pizza oven, or make one yourself. Be careful to use the right materials if making one yourself, as it will need to be sturdy enough to support the weight of the oven. 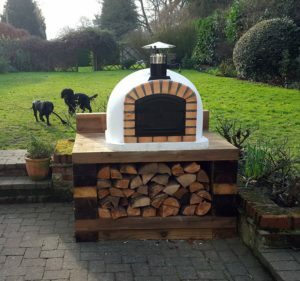 The authentic design makes this wood-burning pizza oven the perfect traditional choice for your garden. Based on traditional Mediterranean Portuguese wood-fire ovens, the Lisboa Wood-Fired Outdoor Pizza Oven offers lots of versatility, so you can cook a wide range of different dishes to suit your guests’ tastes. Bake bread, casseroles, pasta, fish, meat, and even desserts with this multi-functional wood-fired oven. Cook two 12 inch pizzas together in a matter of minutes to feed hungry mouths when needed. Weighing in at 480 kg, each oven is handmade to perfection and is suitable for both commercial and domestic use. The indoor cooking area measures a spacious 75 x 70 x 90 cm, giving you flexibility when cooking. The Lisboa pizza oven comes with a recipe CD to get you started with fire-ovens, as well as the crack repair kit. Another nice feature is the steel door thermometer, which monitors the cooking temperature inside the oven and keeps you in control. This authentic pizza oven comes with a 36 inch wood-handle pizza peel, so you can get cooking right away.